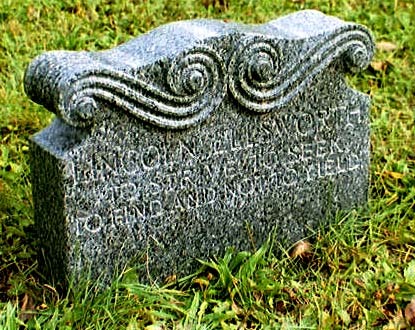 Another Ohio Site--Lincoln Ellsworth's grave. Episode: 69. Site Number: 106. Date Posted: 11 November 1998. Location: Hudson, Ohio, USA. Type: Grave. Lincoln Ellsworth made important contributions to aviation in both the Arctic and Antarctic. Along with Amundsen and Nobile he flew over the North Pole in 1926 and with Hubert Wilkins made four Antarctic expeditions between 1933 and 1939. In 1935 in the Polar Star, he and Herbert Hollick-Kenyon were the first to fly across the continent, a feat not repeated until 1956. 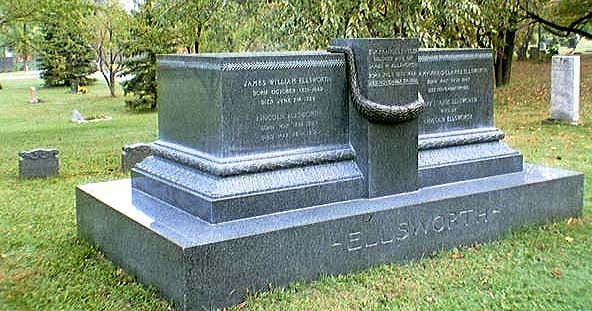 Ellsworth is buried in Hudson, Ohio, now an outer suburb to Cleveland. His boyhood was spent here and he attended Western Reserve Academy, a prep school with a lovely campus on the edge of town. On route 91 a few hundred yards away is the Markillie-St Mary's Cemetery where, in the far back section, are a number of Ellsworth family graves and markers. The most obvious is a large highly polished black granite, flat-topped, rectangular monument with a bronze garland encircling the center vertical element. The design seems to exude a vaguely Napoleonic feel. Antarcticans will recognize the quote from Tennyson's Ulysses on Lincoln's marker; it often appears in connection with Scott and is carved on the cross on Observation Hill above the Discovery hut.